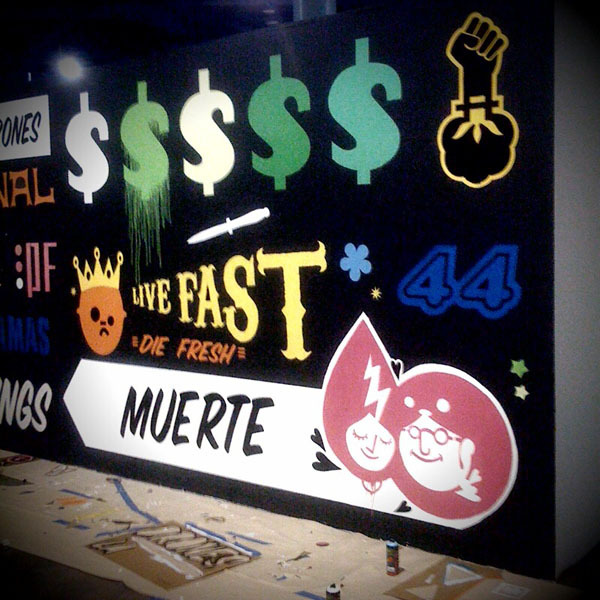 In January 2010, I was contacted by an artist known as BooksIII who told me about a mural he had painted at the Mia Art Fair together with Typoe and She Kills He. BooksIII is from Miami, Typoe is Cuban and She Kills He is from Venezuela – all of them are inspired by Bodega writing. Having read about Chicha Posters through Creative Review they saw a connection and thought the style would be a perfect way to collaborate through. Knowing that I was similarly interested in all things Chicha they kindly got in touch. In 2011 BooksIII has expanded the project has been expanded to include 50 artists… Here is the statement of intent from the Primary Flight… “Primary Flight interprets the designs and concepts of more than 50 local and international artists in Para Mi Gente, an exhibition inspired by the Chicha poster art of Peru. Translated as “for the people,” Para Mi Gente merges traditional Peruvian propaganda, contemporary art and graphic-driven installations. Participating artists such as Shepard Fairey, Tristan Eaton and gallerist Fred Snitzer have provided Primary Flight with vector images that will be cut into stencils and collaged together to generate one, fluid Chicha-style piece. This show is co-curated by Books IIII Bischof, Typoe and Chris Oh. “The Chicha poster art movement has largely been attributed to the Urcuhuaranga family in Lima, Peru. Unable to afford the cost of printing their own posters to promote local Chicha-music bands, father and sons conceived a homegrown press as a do-it-yourself solution. Vibrant embroideries and Huanca textiles native to the Andean region inspired their fluorescent palette, while distorted fonts and logos emerged to fit increasingly more information onto the posters. Para Mi Gente will be an installation of hundreds of artist-designed logos, texts and icons, collectively arranged and curated in the Chicha aesthetic. As the street mural movement rapidly evolves in Miami, Primary Flight art collective looks toward grassroots Peruvian propaganda to inspire its latest fine arts exhibit. For more info check out the Modart blog.